This 16 watt compact fluorescent reflector has a medium base, allowing for easy replacement of an incandescent floodlight. 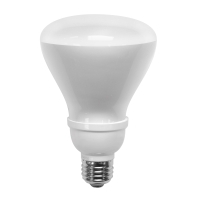 The bulb has a color temperature of 2700K to provide a warm white color. It produces 750 lumens of light, making it a suitable replacement for a 65 watt incandescent floodlight. The bulb is rated 8,000 life hours.